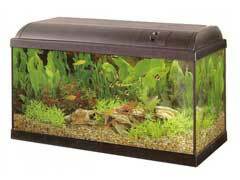 Your first step should be to decide on the size of your new aquarium. Don’t go more than 50 gallons for your first time. Large tanks require complicated filter systems that require a lot of maintenance. For smaller tanks all you need is an overflow filter sized for the new tank, and water. Of course, some form of rock or even sand should be spread on the bottom. Small rocks are best for beginners to the world of tropical fish tanks. Rocks are easy to clean with aquarium vacuums, sand not so much. There should also be plenty of structure for the fish to hide in and behind. They need this to feel secure; this lowers stress and enhances life span. Tropical fish tanks that stay on the warm side or have more than two fish should have an air pump and bubble stone installed. Most tropical fish can eat tropical fish food flakes. Some larger fish, though, need feeder fish or frozen shrimp, these fish should be avoided by beginners. Be sure to only feed your fish what they can eat at once, leftover food will throw off ammonia and nitrate levels and cause algae blooms. Always ask the employee getting the fish for you what your new fish eats; never assume they will just eat flakes. Unless you have a simple goldfish tank you will need to add lighting to your tank. Fluorescent UV lighting should be used at least 8 hours a day. This can help warm the tank. If it gets to warm, you’ll need to open a section of the lid to allow water to evaporate. If you have trouble keeping the temperature up, there are a number of tank heating products available for tropical fish tanks.